Kitten with a Whisk: Be Crabby Cakes! Crab Cakes can be very temperamental. You have to get the ingredients just right, cook it to the point of perfection, and then hurry up and eat it before it goes past its prime. 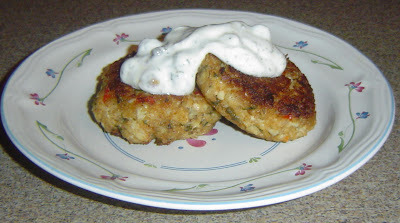 I’ve only attempted cooking crab cakes at home once before last night. This was about two years ago and while it wasn’t bad – it wasn’t a great success either. I think last night's attempt went much better. I didn’t reference any other recipes and went with my gut on this one. 2. In a medium sized mixing bowl add crab, lemon juice, parsley, seasoned salt, egg and the cooked peppers, onion, and minced garlic. Mix together. (I beat the egg first. It’s an OCD thing. For some reason, I think if I don’t the egg won’t evenly distribute throughout the mixture.) If you want a more prominent garlic flavor add the extra teaspoon of the garlic powder, but if you don’t care for garlic you can omit it. 4. Once you’ve reached the desired consistency take a portion of the mixture and form it into a patty. My cakes were about 1.5” in diameter and about ½” thick. In order to make them uniform, I first make the mixture into a little ball that fits in the palm of my hand and then slowly flatten them out. I was able to make 5 with my palm. Once you’re patties are made place them in the fridge to set for about 10-15 minutes. 5. In a medium sauce pan, add equal parts of butter and EVOO. About 1 tablespoon each. 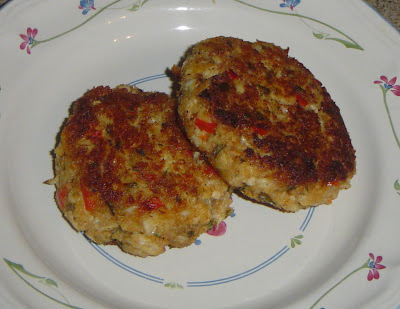 Over medium to medium-high heat, add your crab cakes and pan fry until golden brown and crisp. Mine took about 4 minutes. Then flip (carefully) and repeat. *This made recipe made 5 medium crab cakes and served two of us. My thoughts on this dish: From what I can recall this attempt was defiantly better than my last. The outside had a nice crust and the inside hot and soft. I thought the ratio of crab to other ingredients was just about right. While you do want the crab to be the dominant flavor, you also want it to have a little more depth. I think I was able to accomplish that this time. I felt the peppers and onions added a lot of flavor to the cake and the garlic played nicely in the background. I have no idea what else to call this. This recipe is derived from one I saw Sam the Cooking Guy use one episode. It looked tasty, and I thought something similar would be nice for the crab cake rather than just plain old tarter sauce. After tasting it, I think it would pair nicely with other kinds of seafood as well. 1. 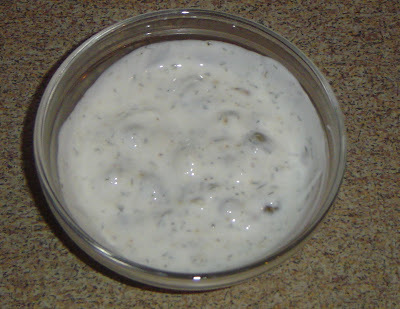 In a small mixing bowl add the yogurt and lemon juice, and whisk together until smooth. 2. Add the capers and dill. * I didn’t roughly chop the capers but probably will the next time so they are more evenly distributed and the sauce looks smoother. Add the dill as well. I did this little by little to make sure I got the amount of dill flavor I wanted. 3. Lastly add some black pepper. Allow to set in the fridge for about 30 minutes. When I first tried it before placing it in the fridge I was a little scared - I’m not gonna lie to you! It didn’t taste like what I had hoped for; little too tart and tangy. But instead of ust tossing it, I let it sit in the fridge while I made the crab cakes. I figured I would try it anyway once they were done to see how they might pair with the cakes. That’s when the magic happened. After sitting in the fridge for a bit, the flavors really blended well together and the tartness reduced. Overall I was really pleased with the end result, and will probably use it on something else in the near future. Together I thought the sauced paired very well with the crab cakes. It was hard to resist going back for more. 1. In a sauté pan add 1 tablespoon of EVOO, minced garlic, red bell pepper, and onion. Season with S&P and sauté over medium heat until soft. Set aside to cool.